FREE for Mint Members | Not a member? Call 704.337.2000 to join today! Join us for our MEMBERS ONLY first look as we celebrate the opening of Women of Abstract Expressionism, which includes canvases by such renowned artists as Helen Frankenthaler, Lee Krasner, Joan Mitchell, and Grace Hartigan. This is the first major museum exhibition to focus on the groundbreaking women artists affiliated with the Abstract Expressionist movement during its seminal years, between 1945 and 1960. You’ll get an exclusive look at this exhibition, while enjoying a tour led by curator Dr. Jonathan Stuhlman, Senior Curator of American, Modern, & Contemporary Art. Let us know you’re coming! Please RSVP to Jessica Schwartz: jessica.schwartz@mintmuseum.org or 704.337.2112. 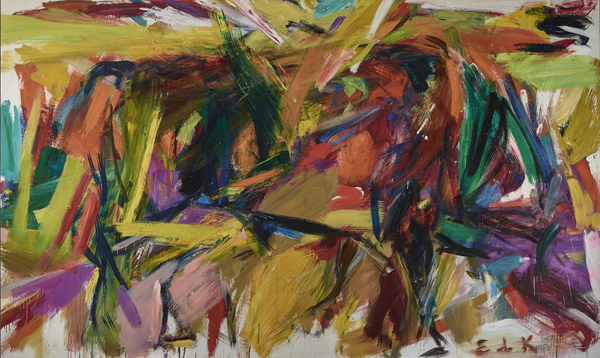 Image: Elaine de Kooning, Bullfight, 1959, oil on canvas, 77 5/8 x 130 1/4 x 1 1/8 inches. Vance H. Kirkland Acquisition Fund, 2012.300. © Estate of Elaine de Kooning.